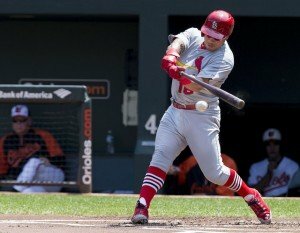 It’s every baseball players dream to hit a walk-off home run in the playoffs and rookie second baseman, Kolten Wong, made that dream come true. Facing Sergio Romo with the game tied 4-4, Wong led off the bottom of the ninth inning for the Cardinals and took the 0-1 count into the right field bleachers. It was Wong second home run of the playoffs and only his third hit in 17 at-bats. The Cardinals won the game 5-4 to tie up the series at a game a piece. 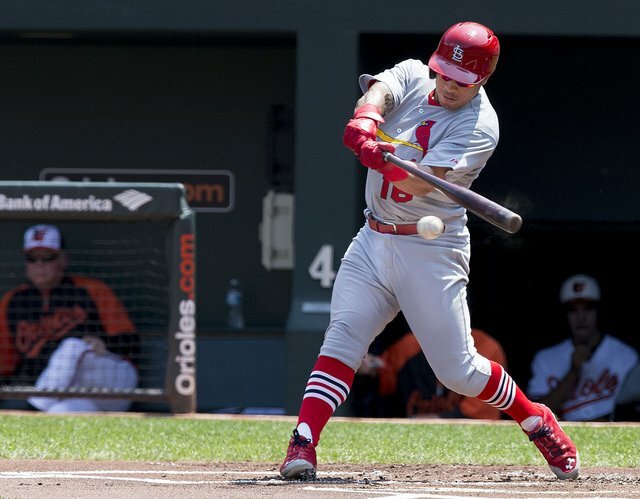 St. Louis did have a huge loss in the game, when Yadier Molina strained his oblique in the sixth inning. It didn’t look good for Molina and I doubt he will return in this series, but you never know with Molina. St. Louis scored four of their five runs off of solo home runs from Matt Carpenter, Oscar Taveras, Matt Adams, and Wong. Three of them coming in the seventh, eighth, and ninth to continue their scoring spree in late innings. The Cardinals have now scored 18 times after the sixth innings during this postseason. St. Louis finished last in the NL in homers this season with 105, but have already hit 11 homers in six playoff games. Randal Grichuk hit a single with the bases loaded in the fourth, to drive in the only run for the Cardinals that didn’t come off a home run. Trevor Rosenthal blew the save for the Cardinals. Rosenthal started off quick with an out, but after back to back singles, he faced Joe Panik. Panik was able to force a full count and Rosenthal threw a wild pitch that allowed the runner on second to score and tie the game at four. Rosenthal has know to wild from time to time, and I think that Cardinal manager Mike Matheny should consider looking for another guy to close during the rest of the postseason. Rosenthal has struggled during the postseason and it might be time for them to make a change. The Giants had their fare share of chances, leaving nine on base, most notably three with the bases loaded in the top of the ninth. On a positive note for San Francisco, Gregor Blanco bounced back, going 2-5. Blanco was 2-27 in the playoffs coming into the game, and he was the only player to have multiple hits for either team. The Giants had three pinch hits tonight, which is surprising since they struggled so much against the Nationals. The Cardinals had a big pinch hit from Oscar Taveras in the seventh, when he took a Jean Machi pitch out of the ballpark. Lance Lynn pitched a good game for St. Louis going 5 2/3 giving up two runs on six hits. Jake Peavy wasn’t bad, but he wasn’t great either, pitching four innings giving up two runs. Game 3 is Tuesday in San Francisco at 4:57pm ET on FS1. John Lackey (14-10) will pitch for the Cardinals and Tim Hudson (9-13) will pitch for the Giants. I got the Cardinals winning a close one, 5-3.